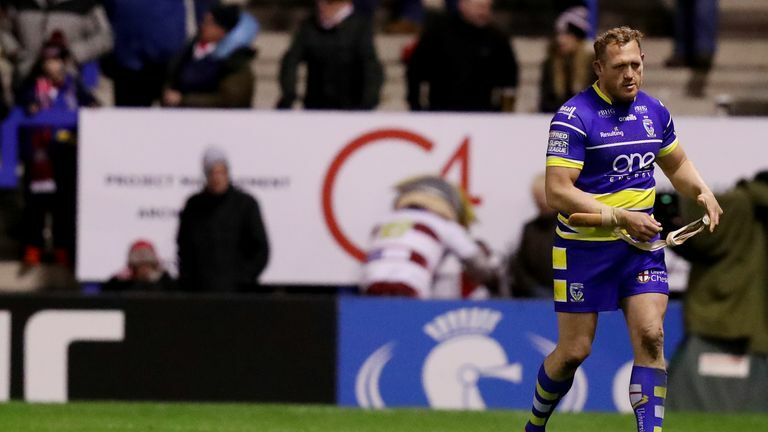 Warrington forward Ben Westwood has been handed a four-match ban for the headbutt that earned him a red card during the 25-12 victory over Wigan. Westwood was charged with a grade D offence by the Rugby Football League's match review panel following a brawl in the closing stages of the match at the Halliwell Jones Stadium. He admitted the offence but challenged the grading when he appeared at the disciplinary hearing. The tribunal found the grading was correct and appropriate, however, and imposed a four-match ban and a fine of £500. Westwood, who served a two-match ban for a dangerous tackle in the Wolves' opening game of the season against Leeds Rhinos, will start his latest suspension when Warrington visit Wakefield on Thursday - live on Sky Sports.